According to OpenLeft and the NY Times, President Obama has settled on Kansas Governor Kathleen Sebelius to Secretary of Health and Human Services. I couldn’t be more pleased. WASHINGTON – President Obama has settled on Gov. Kathleen Sebelius of Kansas, a key ally with a record of working across party lines, as his top choice for secretary of health and human services, advisers said Wednesday. Mr. Obama’s first pick for the job, former Senator Tom Daschle, withdrew over his failure to pay $128,000 in taxes until nominated, provoking a storm of criticism and a presidential mea culpa. With his economic recovery plan signed into law, Mr. Obama plans to turn his attention more to health care next week with a budget blueprint that will begin to advance his ideas about covering the uninsured, advisers said. He may also make health care an important theme of his prime-time address to a joint session of Congress on Tuesday night, they said. It remained unclear whether the White House would finish vetting Ms. Sebelius in time to finalize her nomination by next week. Advisers described her as “the leading candidate” and said there were no others to mention, although they emphasized no final decision has been made. Governor Sebelius, you’ll recall, is the woman I supported for Obama’s Vice. Barack Obama said Thursday he’s chosen his running mate, but coyly kept all the details to himself as he campaigned with one leading contender and planned a major rally to present the Democratic ticket Saturday in Illinois. Obama refused to say whether he’d notified his pick or when exactly he would send cell phones buzzing with the answer delivered via text message. He didn’t reveal his choice to Virginia Gov. Tim Kaine, considered to be on Obama’s short list, even after they met Thursday, according to two people close to the governor. They spoke on a condition of anonymity because they were not authorized to speak publicly. Obama seemed to relish the frustrations of scores of reporters following him this week in anticipation of the announcement. “Wouldn’t you like to know?” he said with a grin when an Associated Press reporter asked when the text would be sent. “I’ve made the selection, that’s all you’re gonna get,” Obama said as he visited a store selling roasted Virginia peanuts as nonchalantly as any other day campaigning in a battleground state. 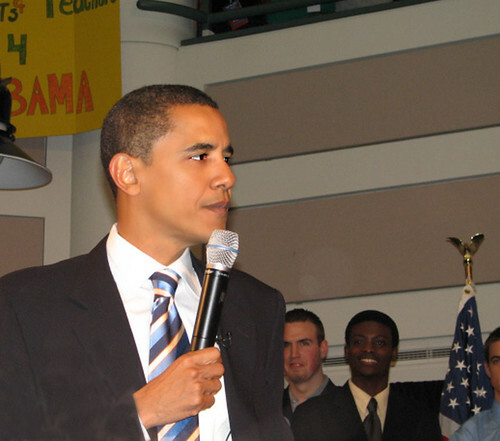 Obama planned to appear with his pick Saturday at the Old State Capitol in Springfield, Ill., where he launched his presidential campaign in February 2007. Obama then planned to travel to the battlegrounds of Wisconsin, Iowa, Missouri and Montana before arriving in Denver to accept his party’s nomination Thursday. One person who had been vetted for the position told The Associated Press there had been no contact from Obama or his campaign about the decision. The person spoke on condition of anonymity because the Obama campaign asked candidates not to speak about the decision. The Illinois senator was widely thought to be considering Kaine, Gov. Kathleen Sebelius of Kansas and Sens. Joe Biden of Delaware and Evan Bayh of Indiana. None of them gave anything away — at least not in words. Kaine and Obama met privately with the governor’s staff for 15 minutes at a Richmond hotel. Afterward, Kaine said he would let the Obama campaign speak about whether the candidate asked him to be his No. 2. But two people close to Kaine said the governor was still in the dark. Kaine plans to fly Friday night directly from Virginia to Denver, site of next week’s Democratic National Convention, three people with knowledge of the governor’s travel plans said. The plans could be changed if Kaine is told he needs to fly to Springfield instead. Biden had a family gathering at his home Thursday afternoon, with his wife Jill, niece Missy Owens and son Beau, Delaware’s attorney general, coming and going past reporters staked outside. Biden is a favorite for the vice presidential nomination among Democrats who think Obama could use his experience and tough campaign style. Biden has served 35 years in Congress, while Obama has served three. “Whoever it is, I am an enthusiastic supporter,” she said but added she would leave the announcement to the campaign. Bayh worked in his Capitol Hill office and later spent time at his home in Washington. He left wearing shorts and a baseball cap but told reporters outside he had no news to share. “Not tonight, sorry,” he said. Sen. Jack Reed of Rhode Island, a national security expert who has been mentioned as a possible candidate, was at his home in Jamestown on Thursday. He told an AP reporter that he was not Obama’s choice and that he had not been asked for any background information. New polls out this week show Obama is neck-and-neck with GOP rival John McCain and still has yet to win over some supporters of Democratic primary rival Hillary Rodham Clinton. The polls sparked fresh discussion of whether Obama would make a surprise selection of Clinton as his running mate. Clinton had other plans for the weekend. She was scheduled to visit the New York State Fair Friday and speak in Fresno, Calif., Sunday at the United Farm Workers of America’s 18th Constitutional Convention.